A series of passeger vessels operated by the Norwegian firm, Hurtigruten, have been upgraded with Rolls-Royce Promas Lite propulsion equipment to improve operating efficiency. Installations on Richard With, Nordkapp, Nordnorge and Kong Harald have reportedly already been able to demonstrate very positive results. Promas comes in various forms. For newbuilds, there is the full Promas, comprising a controllable or fixed pitch propeller, a hubcap and rudder bulb that streamlines propeller flow on to the specially designed rudder that incorporates a bulb, and a twisted leading edge which converts some of the swirl energy that is normally lost into additional useful thrust. Another version of Promas includes a high efficiency propeller in a nozzle, also with a hubcap and a specially designed rudder. Promas Lite is specifically designed for retrofitting to vessels with conventional shaftlines. The main difference compared with the newbuild Promas is that the existing rudder is normally retained, reducing the cost of the refit with only a small sacrifice in propulsive efficiency. 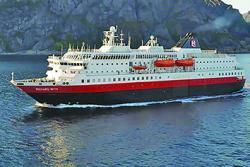 This was the case with the Hurtigruten ships. The conversion work on each shaftline involved fitting a fabricated bulb to the flap rudder, adding the hubcap and replacing the blades of the CP propeller with ones that had been optimised for the specified cruising speed of the Hurtigruten ships and achieved low noise and vibration levels. According to Rolls Royce, the key aim of the Hurtigruten vessel conversions was to cut the power requirement and fuel consumption at a given cruising speed of 15knots. To provide evidence of improvement, each ship had its shaft power measured by a torquemeter prior to going into drydock for conversion. In addition, in-water hull cleaning was conducted before the drydocking in an effort to neutralise the effect of hull cleaning during the docking. Hurtigruten and Rolls-Royce agreed that, due to the fact that more effective cleaning is possible in drydock, coupled with experience based on the vessels’ operating profile, it was realistic to attribute 0.5% of any reduction to the cleaner hull. After the installation of new propeller blades of an optimised design, as well as hubcaps and rudder bulbs, trials were run in conditions as close to pre-conversion as possible. In each case these tests were independently supervised by DNV GL. Rolls-Royce reports that the results were in line with its predictions. The power required for 14, 15 and 17knots was measured before and after conversion for each ship. The wide speed spread demonstrated that savings were being delivered over a range of different operating conditions, and that efficient operation in general had not been sacrificed for a greater saving at the nominated 15knots. The vessels upgraded are similar but not identical, and the tests confirmed good power reductions had been achieved in each case, ranging from a 6.9-11.3% power reduction at 15knots, to 8.9-16.1% at 14knots. In the 17knots scenario, three ships registered reductions of between 2 and 8.6%, but one experienced a power increase of 2%. This anomalous result has been attributed by Rolls-Royce to the pre-conversion single day trial conditions, and the fact that draught and trim were not in this case identical. However, to establish the true situation the ship has been equipped with instrumentation to collect data for analysis over a four month period. For Hurtigruten the return on investment as a result of the refits has made the Promas Lite conversions well worthwhile, Rolls-Royce states. Consequently, a fifth vessel, Nordlys, is to receive the same retrofit with Promas Lite at the beginning of 2017.